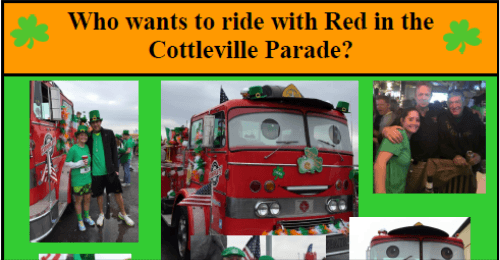 Come out March 12th Saturday and celebrate St. Patrick’s with Red the Fire Truck! The day of the parade you will be required to sign a waiver to ride or walk along red, parade rules. I also recommend to be prepared for a long day! – but we will have refreshments on board with plenty of dance music! Not to mention we will be selling koozies for $5 proceeds will go back to the BackStoppers! – Red is a huge supporters of the BackStoppers! – We will also be giving out koozies, however we ask for a donation.